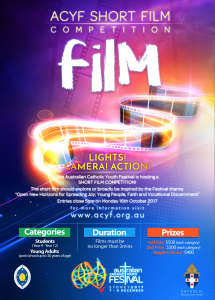 The Australian Catholic Youth Festival is also seeking entries to a short film competition and an art competition that will be curated into an exhibition at the Festival to be held at Sydney Olympic Park from 7 to 9 December 2017. More than 15,000 festival goers will view the exhibits during the biggest national gathering in the life of the Church this year. Reflecting the event theme, Open new horizons for spreading joy: young people, faith and vocational discernment, the short films can be up to three minutes in duration. Artwork entries should also explore and illustrate an understanding of the Festival theme. A completed body of artwork must not exceed one square metre in area for two-dimensional works and one cubic metre in volume for three-dimensional works. Both Competitions are open to upcoming filmmakers and artists from Year 9 to 30 years old. The closing date for entries is 16 October 2017. Malcolm Hart, Director of the Office for Youth said, “These artistic and creative elements of the festival are a unique opportunity to showcase and celebrate the many gifts and talents of young people. 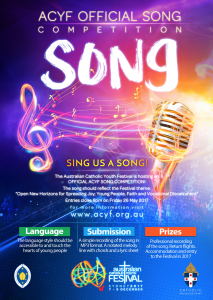 I encourage every parish, school and community in Australia to invite and encourage their young people to participate and to grab hold of this opportunity by exploring and sharing their faith through song writing, film making and artistic creations. A personal encouragement can be just the spark needed for a young person to seize an opportunity, so spread the word in your local school, parish or youth ministry team”. The Australian Catholic Bishops Conference is hosting the three-day Festival in partnership with the Archdiocese of Sydney. Focused on young people between Year 9 and 30 years, the program will feature a series of workshops, concerts, exhibitions, keynote addresses and plenary sessions exploring different aspects of faith. Photos available from the Office for Youth upon request. Further information about each competition is available on the ACYF website, http://youthfestival.catholic.org.au/get-involved/competitions.